My friends and I used to have a book club. Until two of our group moved away…although to be fair, I think I was the only member of said book club that read every book and attended every meeting, so to call us a serious book club the likes of which my mother belongs to wouldn’t be fair. We decided to read books that had been turned into movies, simply because we never really had a good idea of what all you TALK about in a book club…having the movie provided some basis of comparison and “Hey this didn’t happen!” for us to share in. Now that our club has more or less dissolved, I sincerely wish I’d known about TableTopics Book Club edition. 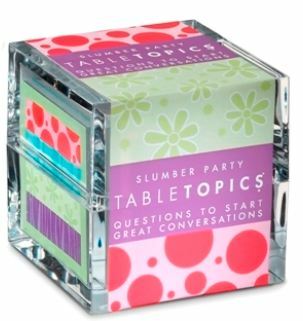 If you’re unfamiliar with the concept, TableTopics are basically pretty, glossy cards with conversation starters to get the ball rolling on a variety of topics – from dinner table dishes (above) to slumber party secrets, the cards are designed to provoke, inspire, and create connections…perfect if you’ve got a group of slightly disjointed gals (and their guys) thrown together for an evening. The cards were actually featured on NBC’s Parenthood the other day – by pure coincidence of me deciding to feature them – although in a slightly less flattering, we. will. be. social. kind of way. Anyway going back to the book club collection. THIS is exactly what every newbie (or existing, if you want to spice things up) book club needs. 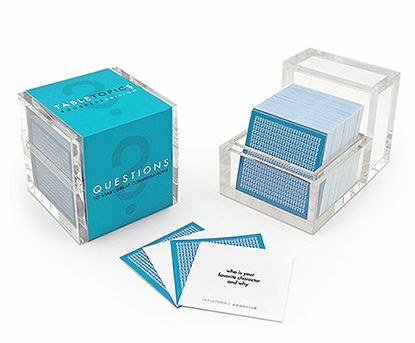 You get 135 cards with questions like “What alternative title would you give the book?” or “What one question would you like to ask the main character?” Stuff that doesn’t have a right answer, requires some creativity, and tons of interactivity – instead of being ashamed to share what might be an unpopular opinion amongst your clan, you can simply giggle at the idea of renaming Sophie Kinsella’s “Mini Shopaholic” to “Serious Crackaholic”. 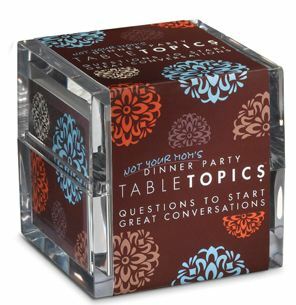 Depending on where you find your box of TableTopics, they range in the $25-$30 price point. A little pricy, but they do come in uber cute, gift-ready, durable packaging. Plus you can use them over and over again with different groups of people, over different years, and most relevantly for this post – with different books, again making that particular set particularly genius. The TT website lists out a handful of Canadian retailers that carry them, but I know Indigo and a bunch of gift stores NOT listed on their site actually have them as well. Happy chattering folks.